It's been a building year. Don't get me wrong. It's been a great year, but it felt very preparatory in a way, like I've been gathering for something greater in 2014. He's even got a red pen! I focused on smaller projects in 2013, since they fit into my schedule much more easily. I also didn't spend much effort on developing leads over the summer, so it felt like I was coasting for a while. It shows in the numbers. The number of projects I did in 2013 doubled from 2012, but the income was about half. I've been keeping my RPG Editor CV up to date, so take a look if you want to see what I've been working on professionally. Since this is a side business, I'm not terribly concerned about the money at this point. I did get to work with a wider group of really cool people, which worked out very well. On a related note, I think I hit a tipping point in December when I got a couple of inquiries in a single week. It's taken 2 years, but people are starting to seek me out as opposed to me asking and pounding the pavement. Not that I'll stop asking, but it's nice to have great gigs fall into my lap. I've been shooting for a blog post a week, and I ended up with 42 posts this year. Usually I've ended up posting on Fridays, madly scribbling something on the morning's train ride, and I don't see that trend changing anytime soon. There's nothing earth-shattering being posted, but I think I've done some good work. On Editing and Writing More Better - I posted a series of writing and editing tips, but tapered off when I got busy in the fall. There's more to come here. I find myself writing more fiction lately, mostly 200 word flash pieces with occasional lapses into Elizabethan sonnets and cyberpunk ad copy. They go quickly and keep my writing muscles limber. I was on a couple of panels at PAX East 2013, and I posted about Worldbuilding 101. Yes, I'm planning on going in 2014, and hopefully speaking again. I hope I'm healthier this year than last. I've posted my share of the usual navelgazing fare about gaming, including evocative titles like Remnants of Analog RPGs; Demons, Practice, and Keeping the Creative Faith; The Rhythm of Year's End; and Holiday Traditions which examines the Boar's Head Feast and thinks about how it would work off-world. 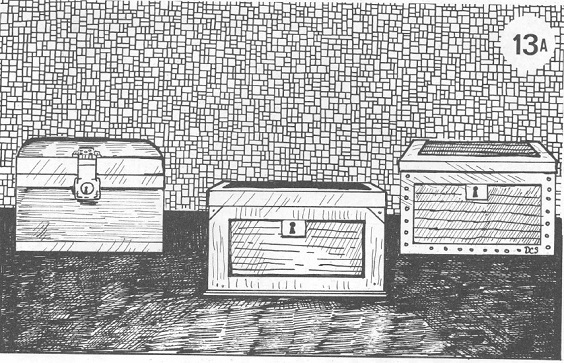 I wrote up a one-page scenario for Brent Newhall's Dungeon Delvers, which I called Village of Troubles (here's the PDF). It's fairly skill-challenge based, but I wanted a counterpoint to the usual hack & slash I've seen with most lighter systems. I wrote a guest post for Troll in the Corner called Three Reasons You Need an Editor for Your Game. Yes, it's mildly self-serving, but many designers still need a nudge to make them realize another set of eyes on their writing is a Good Thing. And I have a hard time not editing, so if there's an extra quotation mark before a quote that'll be the only thing I see on the whole page. And that drives me up a tree. I also wrote up the Deck of Many Legends as a fantasy artifact to support Kaitlynn Peavler's Deck of Legends Kickstarter. It's available under Update #28 if you're a backer, otherwise you'll need to wait until after it ships to take a look. 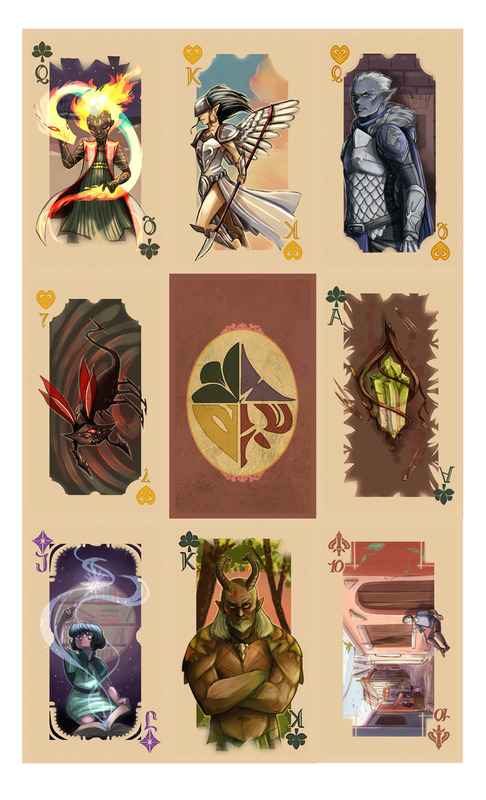 The art for the deck is almost done, and latest estimate has it shipping sometime this spring. I got all of these projects either through the Gamer Assembly or through personal contacts. It's still all about who you know, so hopefully I can make contact with and start talikng to more people in 2014. I've gathered some projects I'm proud of and put them on an Author/Designer Credits page for reference. Feel free to peruse the list and get in touch if you want to talk further about any of them. So yeah. No big breakthroughs this year, but plenty of solid work and good contacts made. And to me the journey is more than a media blitz, so I'm happy with how this year unfolded. Let's see how this year goes. I'm itching to get back to work.